Cid Style File: Has It Been 4 Years? Yes it has, can you believe this little blog of mine turns 4 this month!! Woohoo! Well you know that means its time to celebrate and say thank you to all of the wonderful readers. I really want to do something for you, the readers who have supported and kept me going. Whether your new to Cid Style File or been with me since day one, this celebration is for you. I have a few giveaways planned this month and hopefully will continue through out the year. So make sure you come back every week to find out what other fun things are going on. I'll start off the giveaways with one of my favorite LA jewelry designers, Jenny Dayco. I had the pleasure of meeting her a few years ago during LA fashion week. I immediately loved her designers, which are edgy, fun and modern....so LA! No only are her designers fabulous, but have been worn by many of the hottest celebrities. She is also a very nice and down to earth, which makes her even cooler. I wore her jewelry to BlogHer11 conference and got so many compliments. People loved what I was wearing and I made sure to tell everyone it was courtesy of Jenny Dayco designs. Well now is your chance to own one of her pieces from the Spring 2013 Collection. 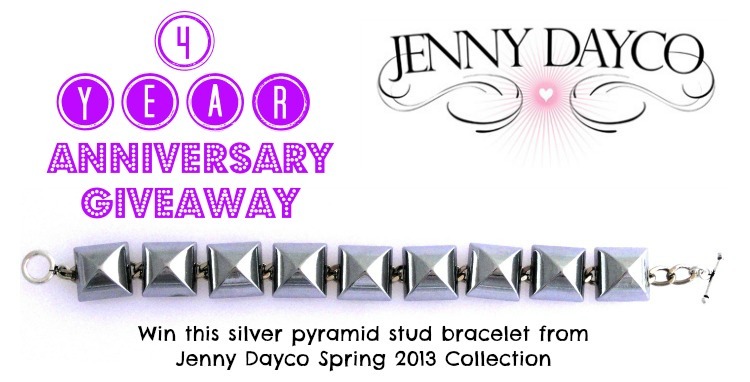 Jenny hand picked this bracelet for one lucky Cid Style File winner. I love it and have always been a fan of studs. So don't miss out and enter below for all the details! Happy Anniversary! How awesome. :) Wishing you much more continued success. Happy Anniversary!! You are a Rock Star!! What a wonderful accomplishment!! Congratulations!!! Congrats on hitting 4 years! What an accomplishment, here's to 4 more!